A team of scientists, led by Dr Marcos Martinón-Torres of the University College London’s Institute of Archaeology, had inspected more than 1,600 arrow heads of the Army and, finding them identical to the naked eye, assumed they had come from a single, large-scale production line. However, when the researchers analyzed the chemical composition of the bronze used to make the arrow heads they found that each quiver-full was made individually with a single batch of bronze being melted in a crucible, without any mixing of batches. The findings, published in the Journal of Archaeological Method and Theory, confirm the extraordinary level of skill and versatility of the craftsmen who created the Army’s weapons. “The first Emperor Qin Shi Huang, who commissioned the Terracotta Army and the rest of the city-sized mausoleum at Xi’an before he died, was obsessed with standardization and introduced standard units of measurement, currency and script. He must have demanded very exact standards for the Terracotta Army’s weapons because their level of accuracy is comparable to that of modern mass-produced items,” Dr Martinón-Torres explained. To make such similar weapons the craftsmen employed what were then cutting edge manufacturing techniques. The team found parallel, microscopic scratches on the blades, indicating that they had been sharpened on a wheel, rather than with a hand held tool. 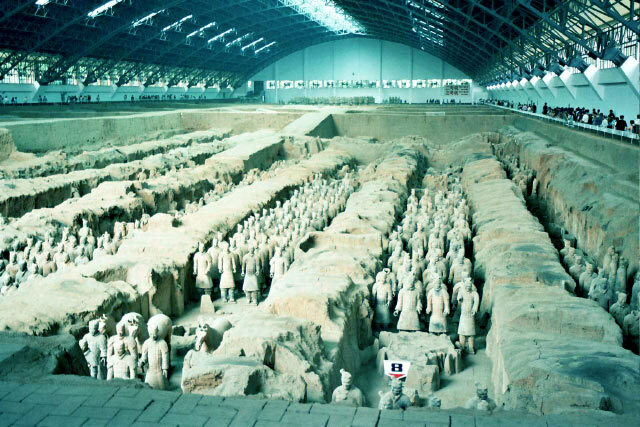 This makes the Terracotta Army’s forty thousand weapons the first known blades to be sharpened with a wheel.